We will learn about helicopter construction, working and affecting factors. It is very useful air transportation vehicle. First practical helicopter VS-300 was designed by Igor Sikorsky and was by the Vought Sikorsky aircraft division of the United aircraft corporation. It took flight at Stratford Connecticut on September 14 1939. Firstly it was Incorporated a single main rotor and tail rotor design. The mechanism of the helicopter is the same as the mechanism of the aircraft. It works on the principle of generating lift. Lift is an upward pushing force that overcomes the weight and sweeps into the air. It is generated by the pressure difference between upper section of airfoil and lower section of airfoil. We have discussed about lift and drag in previous article. Now we will discussed about construction of a helicopter. In the helicopter mostly two types of engines are used. The First one is reciprocating engine and the second one is turbine engine. 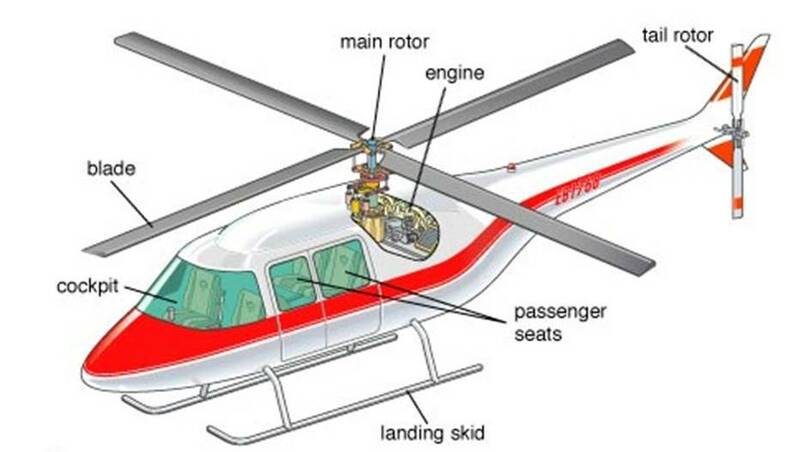 Piston engine or reciprocating engine are basically used in a small helicopter which has less capacity to carry the load. A reciprocating engine is mostly used in the training helicopter because of its simplicity and easy to operate. Turbine Engine is used in the commercial helicopter. It is more powerful and is used in a variety of the helicopter. The operation of the turbine engine is completely different from the turbine engine used in the aircraft. Turbine Engine produces a huge amount of power for their size at the same time it’s very expensive to operate. It is found that 75 per cent of the incoming airflow is used to cool the engine. It is used to draw the filtered air into a chamber called a plenum chamber where the air is compressed. Compressed air is then directed to the combustion chamber where the atomized fuel is injected into it. The air-fuel mixture is being ignited and allowed to expand; it produces a tremendous amount of energy. The combustion gas is passed through the series of turbine wheel causing them to rotate. These wheels give the power to both the engine and gearbox as well. Depend in the model and vary from 20,000 to 51,600 rpm. Combustion process is a continuous process in the turbine engine unlike to piston engine. Combustion chamber is a chamber where the air fuel mixture gets ignited, it continues to burn until the fuel is present. If the engine is on and there is interruption in the air fuel mixture and any of these then it termed as flameout and the engine is being re started. Especially in the helicopter, it has a special system to tackle it called auto to relight which automatically activates the ignite to start the combustion if the engine flame out case appears. In the helicopter, two stage turbines is used to run the engine. The first stage of the turbine is considered to be a gas producer and the second stage is known as power turbine. It is denoted by N1 and N2 respectively. Both stage of the turbine is connected to the common shaft and are mechanically coupled to each other. The gearbox of the engine encompasses all the necessary gear to drive components of the helicopter. Independent shaft connected to N1 and N2 Wheel turbine which provides the power to the accessory gearbox. The first stage of the turbine is used to drive the components necessary to complete the turbine cycle. Second is dedicated to the driving the main rotor and tail rotor system and it are also used to run the air conditioning. It is made up of either metal wood or composite material or combination of any two typically a composite made up of many layer of fibre impregnated resins, bonded together to form a smooth panel. The design of airframe includes engineering aerodynamics, material technology and manufacturing method to achieve a favourable balance of performance reliability and the overall cost. As one can see in the figure that it is the outer core of the frame, the fuselage of the helicopter include the main body section that houses the cabin that hold the crew, cargo and passenger. Especially in the helicopter pilot seat differ with a helicopter. In most of the Cases pilot Seated in the right side but in few of the helicopter pilot Seated in left or centre. Rotor is one of the most important mechanisms of the helicopter which is directly connected to the airfoil and generates lift. It is consist of a mast, hub and rotor blades. Mast, it is a hollow cylinder shape metal shaft which goes upwards or extended to, from and it is supported by the transmission. Attachment point of the rotor blades is called as hub. Swash plate is used to convert the stationary input into rotating input which can be connected to the rotor blades. There are two swash plate is used in the whole swash plate assembly: stationary swash plate and rotating swash plate. In the symmetrical airfoil, the upper and lower surface are identical and produces less lift. But in case of non symmetrical airfoil it’s upper and lower surface are different from each other and that help to produce the lift. Benefit of the non symmetrical airfoil is that it increases the lift drag ratios and more desirable stall characteristics. In the early stage of the helicopter, the non symmetrical airfoil was not used because the centre of pressure location moved too much when the attack angle was changed. Altitude is one of the most important factor in the helicopter mechanism and it affects the performance of the helicopter in the density of the air, which decreases as the altitude increases. It is well known that the increasing density increases the requirements of power in hover and decreases the speed. When the helicopter fly at the high altitude with the high speed is the result of the lower density of the air at that altitude, results in a less power requirements because of the parasitic drag. Reduction of weight is the Holy Grail for the whole aviation industry; it is something which everyone wants but difficult to get it. Weight of the helicopter depends on the size. When the weight of the helicopter increases, the excess power becomes less, but it is especially affected at lower airspeed because of the induced drag. High gross weight affects the maximum height at which the helicopter can fly in the ground effect for a given power available. Under all these conditions it can be conclude that heavier the helicopter, lower the maximum hover altitude. The direction of the wind and velocity directly affect the hovering, takeoff and climbing performance of the helicopter. As the wind speed increases, translational lift increases, result less power is required in hovering. Apart from the magnitude of the wind velocity, its direction is also essential. Headwind is the most desirable parameter in the hovering process because it gives the greatest increase in the performance. This is all major component of a Helicopter and general working of it. If you have any doubt, ask by commenting. If you like this article, don’t forget to share it on social networks. Subscribe our website for more informative articles. Thanks for reading it.